The area of interest is a concept and a Tobii Pro Studio and Pro Lab tool that allows the eye tracking researcher or analyst to calculate quantitative eye movement measures. These include fixation counts and durations. Using this tool, you simply draw a boundary around a feature or element of the eye tracking stimulus whether it’s a button on a web page or an actor walking across a scene in a video clip. Pro Studio or Pro Lab then calculates the desired metrics within the boundary over the time interval of interest. Creating and editing AOIs is straightforward and covered in the user’s manual so this post will focus on features that are less commonly used. We’ll also present a few tips and tricks for designing and analyzing with AOIs. When designing one’s eye tracking stimulus, it is also an opportune time to think about the design of the AOIs upon which the analysis will depend. There are two important considerations regarding the relationship between the stimulus and AOIs: size and placement. A common question researchers ask is how big should AOIs be? To properly answer this design question, the researcher must decide on the proper balance between selectivity and sensitivity. In other words, how much of the gaze data around a target to include in the AOI calculation. Smaller AOIs increase selectivity and exclude more extraneous gaze at the risk of losing some actual valid looking. Larger AOIs increase sensitivity and may include more extraneous data while potentially capturing more of the actual looking to target. The choice will depend on a number of factors, including the data quality, one’s research questions and the statistics employed. This issue goes hand in hand with the preceding as it’s common to have multiple AOIs on a stimulus image, website, or package. Because of this, the space between AOIs may also be a factor in calculating accurate and meaningful gaze metrics. Wherever possible, ensure that adjacent AOIs have sufficient spacing between them to allow the desired balance of specificity and selectivity by applying the “1 degree” guideline. When designing stimuli and AOIs, the “1 degree" guideline is an easy way to take into account the extent of the central visual (foveal) field with which people look and the accuracy and resolution of the eye tracking hardware. For the common case of screen-based displays like desktop monitors or the Tobii T60/120 eye trackers where the participant sits about 60 cm (24”) from the screen, 1 degree translates to approximately 1 cm or 40-50 pixels. In some cases, the analyst might wish to apply several AOIs of the same size and aligned in some way. 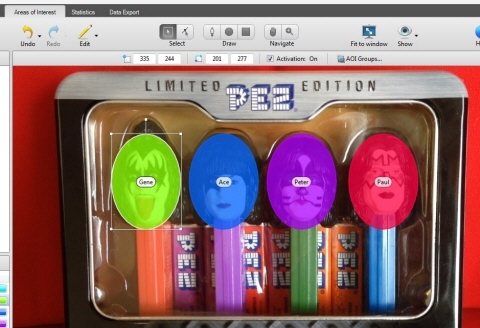 For example, here we see oval AOIs drawn on the faces of the KISS band members PEZ dispensers. We first drew the AOI over Gene’s face and then copy and pasted them over Ace, Peter, and Paul’s faces to ensure that they were all the same size. This is indicated by the values (X and Y extent coordinates) located on the right-top of the image, indicating that the AOI inbound box is 201 pixels in the horizontal direction and 277 pixels in the vertical direction. We have also insured that they are all aligned at the top as the Y coordinate of the upper left corner is identical at 244 pixels for all four AOIs. Now, if we wanted to adjust their placement by, say, 10 pixels, we could then type, 234 in the box and the AOI would then be moved to a new location. Basically, you can control the size and location of AOIs down to the pixel. Pro Studio and Pro Lab treat each created AOI as separate from all others, even if they share the same name. Sometimes, it might be advantageous to aggregate several AOIs into one logical “super AOI” that can span different tests or stimuli. One might do this to totalize looking time to a logo across multiple packaging images or to create a higher level category such as when comparing gaze behavior to logos in general versus specific logos. In Pro Lab you can do this by using the AOI Tag feature and in Pro Studio you can use the AOI Group feature. Learn how to combine different AOIs in Pro Lab by watching the video above. To sum up, Area of Interest in Pro Studio and Pro Lab is a versatile and precise tool for setting up quantitative analyses of gaze behavior. They can help you structure your analysis but to get the maximum benefit, one has to think ahead about their size and placement relative to the features of interest to capture the best data possible.